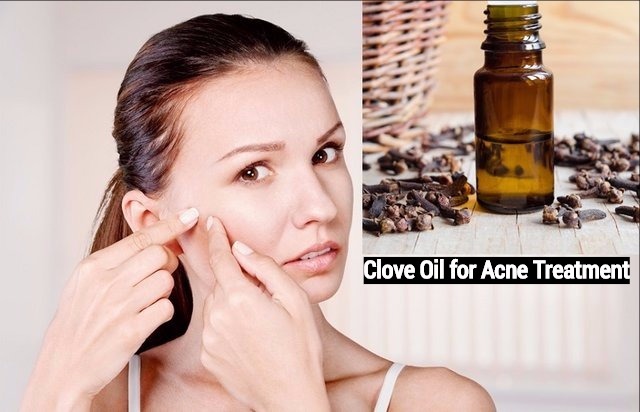 Clove Oil for Acne: How to Use It Effectively? Acne is a problem which majority of teenagers face. Adult acne is also there. There are many natural ingredients to treat acne. Clove oil is one such ingredient that can treat acne naturally. Acne appears when there is an excess secretion of hormones in the body. These hormones lead to increased production of sebum. Due to excess production of sebum, the pores of your skin get clogged with sebum and dirt. This causes acne to appear on your skin .Acne can be painful at times. The swelling of the skin as well as the bumps and scars left by the acne can spoil your look. Some people find them very embarrassing. There are different ways to treat acne. A large number of commercial and OTC acne treatment products are now available in the market. However, majority of these products contain chemicals in them. These chemicals can cause further damage to your skin. If you have sensitive skin, you should never use the chemical laden products. It is better to use solutions made from natural extracts. So, clove essential oil is a good option for you. Why Use Clove Oil for Acne Treatment? Clove oil is an essential oil that is derived from the dried flowers of the clove plant. it is known for its antibacterial properties. It is pale yellow in colour and has a spicy, heavy aroma. It has been found to be toxic to a large number of bacteria. It also has anaesthetic properties. This has made it very beneficial in the field of dentistry as it can help reduce dental pain. The analgesic and antiseptic properties of this oil make it very effective for the skin and to fight against acne and other skin conditions. It has the ability to kill the skin impurities and bacteria that cause acne. In addition, it also helps in reducing the pain that you experience when you suffer from cystic acne. How to Use Clove Oil for Acne? There a many ways to use clove oil to treat acne. One thing you have to keep in mind is never to apply concentrated clove oil directly on your skin. This can cause skin irritation as well as burning sensation. This is because in its raw form it is very powerful. You will have to mix it with carrier oil that is gentle and suitable for the skin. Mix clove oil and carrier oil in the ratio 1:10. Then you can apply it on your skin. Use it twice or thrice daily. Mix clove oil with olive oil and apply it on the affected area. You can also use pure coconut oil instead of olive oil. Coconut oil is soothing and very beneficial for the skin. Leave it for about 15 minutes and then you can wash it off with water and mild soap. Take the yolk of an egg and mix it with a few drops of clove oil. Apply this on the skin affected with acne. Let the mixture get dry and then you can wash it of using lukewarm water. Like clove oil, tea tree oil is also known for its strong antibacterial properties. A mixture of clove oil and tea tree oil has the ability to kill the bacteria responsible for causing acne on the skin. You may also add some aloe vera gel to the mixture and dilute it. This makes it milder for the skin. You can add a few drops of clove oil to the moisturising lotion that you use daily. Apply this on your skin. With regular use you will see the difference in your skin. The inflammation in your skin will be reduced considerably. If you use makeup frequently, then you can add clove oil to the foundation you apply on your face. all you have to do is to add 10 to 15 drops of clove oil in your foundation and shake the bottle well. Now you can apply the foundation just as you apply it on your face when you go out. By applying it this way you will see that there will be less irritation when you remove the makeup. The skin also looks better. Clove oil is great for getting rid of acne. But you should be cautious when you use it to treat acne. Make sure that you do not let clove oil remain on your skin for a long time, no matter what carrier oil you use with it. it you leave it for a long time, it can burn your skin. After about 15 to 20 minutes you should wash it off with water and pat dry your skin with a soft cloth. If you have sensitive skin, then it is important that you do a patch test before you use it on your skin to get rid of acne. Apply it on your hand or any other part of the body before you apply it on your face. This is because the skin of your face is very sensitive. If it shows any reaction, then you should avoid using it for treating acne. If applying the oil cause any complication on the skin, visit a dermatologist immediately. Clove oil is not only good for treating acne, but also for banishing the scars left behind.